As business slows at the Palmer House Hilton Hotel every winter, Chiquitta Rivers, 26, a house attendant, is laid off and loses her health insurance. Rivers lives with diabetes and being uninsured makes obtaining medicine difficult. Skipping regular doses of insulin can cause long-term health complications for diabetics. Rivers also reported rapid weight loss and frequent mood swings when she could not afford her medicine. In Rivers’s eyes, living without healthcare is not an option. On Sept. 7, she went on strike with hotel workers across Chicago, demanding year-round health insurance, healthier work conditions and increased wages. 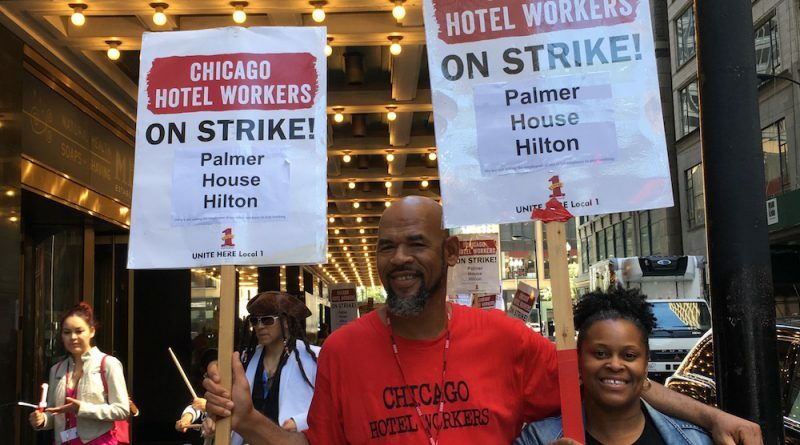 Six days into the strike, housekeepers, cooks, doormen and servers marched in circles outside the Palmer House on Monroe Street and Wabash Avenue carrying picket signs and chanting. Their last union contract, which the union UNITE HERE Local 1 negotiated to cover 6,000 workers at 30 hotels, expired on Aug. 31, 2018. The union wants each hotel to sign a revised contract that meets their new demands, including year-round health insurance for every employee. Larry Lewis, 39, has worked as a houseman for 18 years at the Palmer House. While he maintains his position and health insurance year-round, many of his co-workers with less seniority, such as Rivers, do not. Housekeeper Bobby Thomas also sees year-round health insurance for all workers as a top priority. In 1996, her starting rate at the Palmer House was $6.93 an hour, and she struggled each time she lost her employment and benefits. She makes $19.72 an hour now. Workers have also expressed concern over the strenuous physical demands of their duties along with an increased workload. According to Thomas, during the music festival Lollapalooza in early August, housekeepers have had to work six days a week, often completing double shifts or staying overtime. Compared to all other service sector workers, hotel workers experience a 40 percent higher chance of injury, according to a 2010 report by the American Journal of Industrial Medicine. And between 2015 and 2016, the number of fatal injuries for leisure and hospitality workers increased by 32 percent, according to the Bureau of Labor Statistics. Ernest Fizer, who has worked at the Palmer House for over two decades, also voiced frustration over the demanding work conditions that compromised his health. Fizer has carpal tunnel syndrome in both hands. “I’m trying to get off [work] to get the surgery so I can come back and provide for my family,” he said. Although he has year-round health insurance, he remains concerned with the declining quality of his coverage. “We have to fight for better. [The plan] is not good for my family,” he said. Eight years ago, Tina Graham, a strike captain, participated in her first strike at the Palmer House. It lasted one day. Graham sees this year’s strike, with 26 hotels participating, as significant in terms of duration and size. As the strike is in its second week, workers are not backing down. On Sept. 13, UNITE HERE Local 1 is holding a march through Chicago’s downtown.